Lenovo Vibe X2 - Running Android L and coming at IFA 2014! You are here: GeekSays Technology News » Android » Lenovo Vibe X2 – Running Android L and coming at IFA 2014! Lenovo Vibe X2 – Running Android L and coming at IFA 2014! 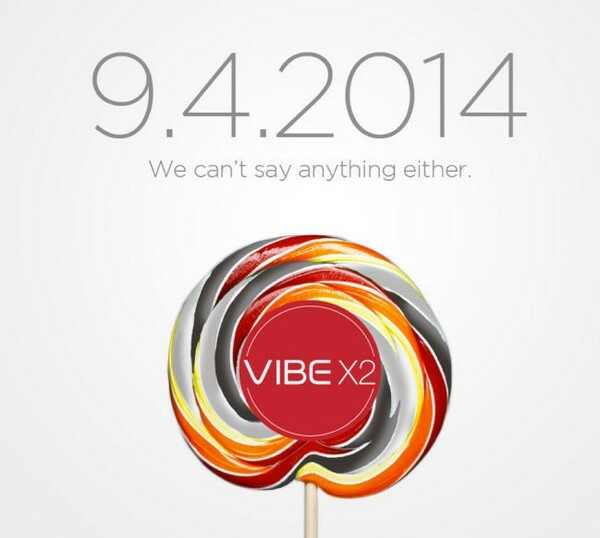 Featuring just the date and a lollipop, a hint the it’s going to run Android L, makes things very interesting. But, the thing we like the most is the “We can’t say anything either” line, a clear reference to the invites sent by Apple, which were claiming that they wished they could say more about the iPhone 6 event. Could the Lenovo Vibe X2 be a competitor for Apple’s smartphone? According to the latest leaks, the phone will be powered by an octa-core CPU, clocked at 2.2 GHz, alongside 2 GB of RAM and 32 GB of built-in storage. The snapshots taken with the 13 MP rear-camera will be displayed on a 5″ 1080p screen, while on the front, it will sport a 5 MP snapper. We don’t know about you guys, but even though they’re not such a big name on the smartphone market, we think that Lenovo Vibe X2 will be one of the best phones released at IFA 2014. Any opinions on this? What do you think about their idea of taking a shot at Apple’s iPhone 6?